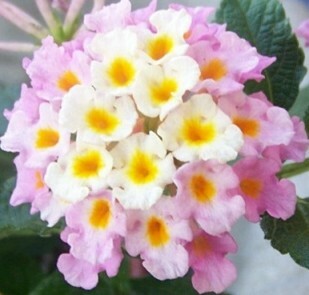 If you have arrived here from the Herbal Remedy Pages, please scroll down for medicinal properties of Lantana. Lantana (or White Sage) is a woody, shrubby perennial plant that does well in containers, as a bedding plant, or on a slope for erosion control. Many are hairy, prickly plants that have a kind of spicy-pungent odor when bruised (some liken this smell to cat pee, unfortunately). Lantana offers bright color that is attractive to bees and butterflies, making it a good addition to a Habitat-type of situation. The flowers are borne in clusters and are bi-colored, somewhat resembling the common Verbena (they are in the same family and are close relatives). Lantana is not related to the Sage family, despite it's nickname. Flower colors include white, blue, purple, orange, lilac, and yellow. Yellow and orange are by far the most commonly available colors and can be found in just about every garden store all season. You might have to hunt for some of the other colors, but they too are readily available in most areas. Lantana does well in sun or part shade, and prefers a rich, loose, well drained soil, although it will still perform well in less than perfect conditions. It does appreciate some shelter from the elements, and does well alongside a fence or against the house. It has naturalized in certain warmer areas, such as Florida and Texas, and is drought resistant once established. It will not tolerate severe winters, so grow it as an annual if you are below Zone 7 or so. It is a low-maintenance plant that can grow up to 8 feet if it is happy in it's position, but pruning works well if you prefer a smaller shrub. It mingles well in mixed borders and also makes an attractive specimen plant (but you will have to pinch it to make it more full). Deadheading spent flowers is also a good idea with this plant to encourage more bloom. Lantana can be propagated by cuttings, root suckers, or seed. Cuttings take a long time to bloom again, but once they start blooming they will keep it up, and they are a very good way to make new plants. The seeds are borne at the tips of the stems and are berry-like, starting out as green, and later turning purplish-black. Once the seed has ripened (turned black), it can be planted immediately with no further preparation, but if you are sending seed to a friend or want to store it, let it dry in an airy place on paper towels for a few days before storing. Be careful about kids and pets eating Lantana seed, as it can be pretty toxic when overdosed (there has been one known child fatality). Toxicity is in the green seed only - once the seeds turn black, they are no longer a threat. See the picture to the left for a fairly clear illustration of the seeds in their various stages. The rest of the plant is used almost world-wide for it's medicinal properties, and crushed leaves make a good furniture polish. Medicinal Properties: Lantana is one of those plants with only scattered and often conflicting reports on it's use in herbal medicine, so approach this one with caution. 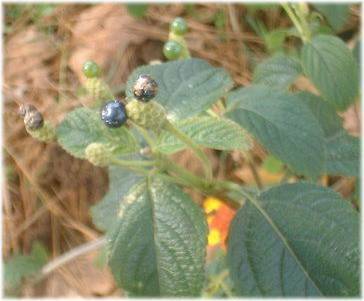 As stated above, the green berries are toxic, and there has been one human fatality attributed to them. Animals will also be affected by eating these plants, though in the documentation I have studied, it doesn't say whether it was the leaves or the berries that caused the toxicity (though I suspect it was the berries). Most domestic animals will not eat this plant, probably due to a combination of the taste and smell, so they are not a huge problem in the home landscape, but Lantana has been known to cause fatalities in farm animals, such as cows and goats. Although working around Lantana plants can cause a dermatitis type of rash (probably due to their spiny nature), the leaf actually seems to work as a soothing agent in cases of insect stings, skin eruptions, cuts, scrapes, ulcerations, the itch of measles and chicken pox, and finally, parasites, such as scabies. See How to Make Herbal Oils & Ointments for specifics on how to use this plant for these problems. Another method of itch relief is to place a handful of fresh leaves in a mesh bag or something similar, and place it under the bath tap water. Lantana is mentioned in folklore as being of help in snakebite cases, and it definitely wouldn't hurt to use it when available in cases of snakebite while camping, etc. In such an emergency, crush the leaves and apply directly to the affected area. Also, if you find yourself without a toothbrush, Lantana stems make a decent substitute because of their spiny nature. Lantana leaves can be used in a Tea for relief of symptoms of rheumatism (a bath might help too - see above), indigestion, joint pain, flu, coughs, colds, sore throat, fever, and possibly tapeworms - and can be boiled and eaten for relief from headaches, body pain, and toothaches. The leaves also seem to work as an inhalant for respiratory problems. To use as an inhalant, pound the leaves, and boil in water with a tight fitting lid for about 5 minutes. Using a funnel, pour the hot liquid into a glass container with a narrow mouth, and inhale continuously until the symptoms retreat. This strategy can also be tried for headaches and colds. It appears that Lantana has properties that are promising in some of the more serious diseases, such as diabetes and cancer, and that it works almost as well as some of it's chemically-based peers in suppressing the immune system for organ transplantations. These studies are in their infancy, but definitely warrant further research. Lastly, Lantana leaves, dried and burned in a glass jar or other fireproof container, have been used for centuries as a natural mosquito repellent. Consider mixing them with beeswax that you can find at any crafts store for a homemade herbal mosquito repellant at your next outdoor party. More information on Lantana is available in the Gardening QA Section. Click here to see what other gardeners are asking.